The study's lead author, IMAS Ph.D. student Jess Ericson, said the long-term laboratory study was the first of its kind. "Our study found that adult krill are able to survive, grow and mature when exposed for up to one year to ocean acidification levels that can be expected this century," Ms Ericson said. 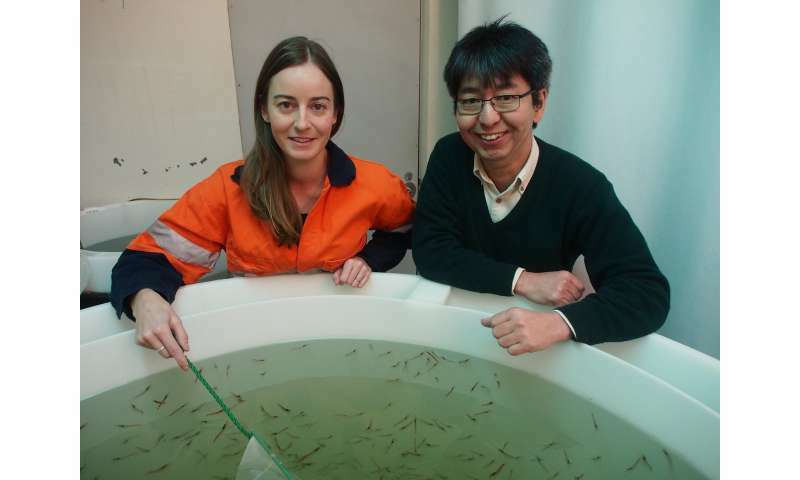 "We reared adult krill in laboratory tanks for 46-weeks in seawater with a range of pH levels, including those in the present day, levels predicted within 100-300 years, and up to an extreme level. "We measured a suite of physiological and biochemical variables to investigate how future ocean acidification may affect the survival, size, lipid stores, reproduction, metabolism and extracellular fluid of krill. "Our results showed that their physiological processes were largely unaffected by pH levels that they are expected to counter over the coming century. "The adult krill we monitored were able to actively maintain the acid-base balance of their body fluids as seawater pH levels decreased, thereby enhancing their resilience to ocean acidification." "Ocean acidification caused by anthropogenic carbon dioxide emissions is predicted to occur most rapidly at high latitudes, such as in the Southern Ocean. "Krill are a major prey item for marine mammals and seabirds, and any decrease in their abundance as a result of ocean acidification could result in significant changes in the Southern Ocean and Antarctic ecosystem. "Increasing ocean acidity is known to have negative effects on a range of marine invertebrates, causing decreased mineralization or dissolution of calcium carbonate shells, decreased or delayed growth, increased mortality and delayed reproduction or abnormalities in offspring, including embryonic development of Antarctic krill. "Our finding that adult Antarctic krill appear resilient to such conditions is therefore an interesting and significant result. "However, the persistence of krill in a changing ocean will also depend on how they respond to ocean acidification in synergy with other stressors, such as ocean warming and decreases in sea ice extent," Ms Ericson said.